Berlin - Bayern Munich forwards Robert Lewandowski and Kingsley Coman were involved in a fist-fight during training on Thursday, according to a newspaper report. German tabloid Bild reported that the two players "punched each other in the face" during an argument at a behind-closed-doors training session on Thursday morning. Lewandowski, 30, reportedly chastised Coman, 22, during a training exercise, and the exchange of words quickly escalated. The two players were separated by defenders Niklas Suele and Jerome Boateng, Bild reported. 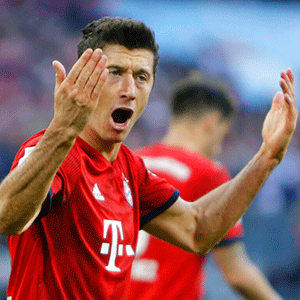 Bayern are top of the Bundesliga after their 5-0 demolition of title rivals Borussia Dortmund last week. Yet Niko Kovac's side are still feeling the pressure, with just a point separating them from Dortmund with six games to go. On Sunday they are away to Fortuna Dusseldorf, who gained a league draw in Munich in November.